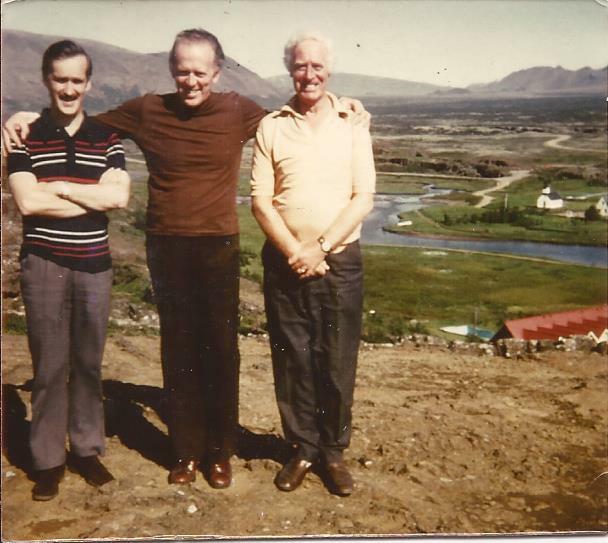 RL (Bob) McSwein, left, as we normally see him these days, with Ian Clifton, right. 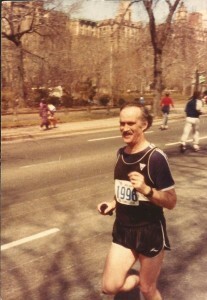 RL McSwein (born on 6th March, 1935 and better known as Bob) has been involved in Scottish Athletics for over 50 years. He is one of the best liked, most respected and level headed officials and administrators of the very top flight. His father Duncan was heavily involved in the sport and was treasurer of the SCCU from 1948 to 1972, and his brother, also Duncan, was President of the SCCU and of the Scottish Schools Athletic Association. 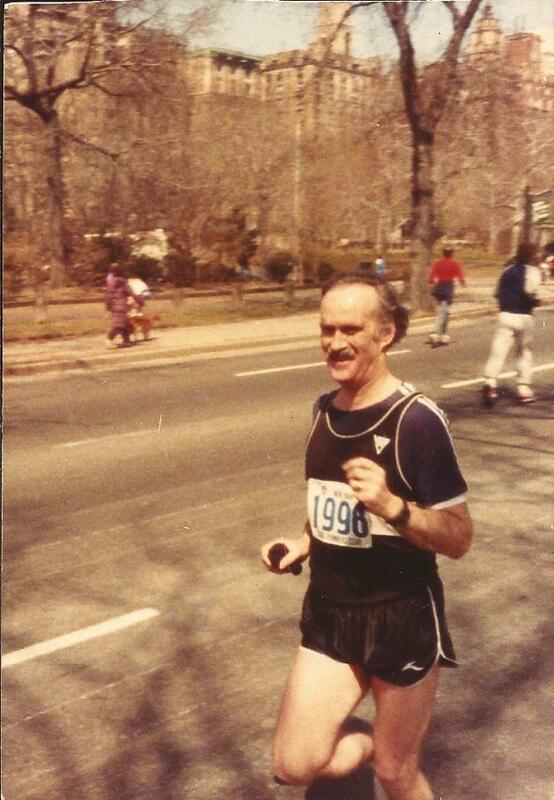 Bob is also that rare bird – an athletics official who is a runner in the truest sense of the word. 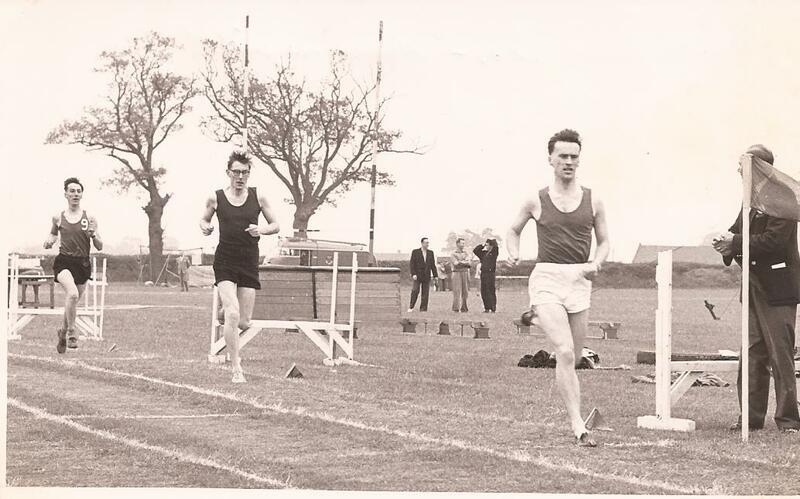 He joined his local club, Greenock Wellpark Harriers in 1947 at the age of 12 but in those days there was no competition allowed until the age of 15. Frustrated, he had to wait the three years before he could take part in events outside his own club. On reflection he now feels that it is no bad thing for young athletes to wait a few years before getting into the demands of racing. Unlike many who were more gifted, Bob just kept on running while he was developing his career in administration and officiating. In the 1970’s when the ‘running boom’ was taking off, many of the top men in the sport were saying that running was good for your health and should be taken up by everybody who cared about their own well being. One even came out and said on TV that all you needed were a pair of shorts, a vest and a pair of running shoes and Bob, as they say, was your uncle. Very few in positions of power actually took their own advice. Bob had in fact never stopped so he didn’t have to start again. Not international class at any time but a man who runs because he likes it and loves the sport. 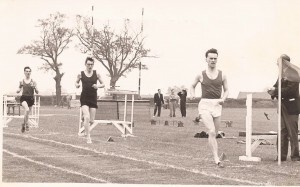 The first record I have for him in a championship is in 1954 and he was still running in 2011 – 57 years later. In his early days he says that he raced in Dunlop Green Flash tennis shoes and had the temerity to ask the local cobbler to add a sliver of leather under the heels. 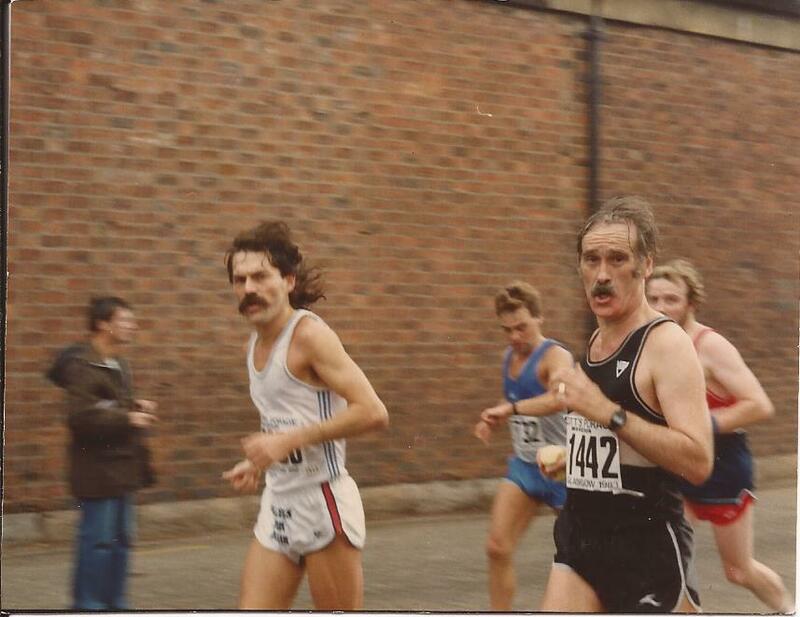 He ran in three Glasgow Marathons – 1982, 1983 and 1984 – with a personal best of 3:22 at the age of 48 in 1983: he says he was up at 50 or 60 miles a week at that time. He was still running in 2011 when a bad road accident (not his fault) broke his neck in two places. He is now fully recovered from that and plays golf about three times a week but has had to stop running. Like all runners he has kept a training diary and if you do your adding up properly, you will see that his lifetime mileage is over 48,000 miles. Bob is an Honorary Life member of Scottish Athletics for all that he has done in and for the sport. If we look at the 1995 – 96 SAF Handbook we see a list of the various posts that he has held. It tells us that he was at that time Convener Road Running and Cross-Country Commission; Road Running and Cross-Country Representative to SAF; delegate to UK Cross Country Commission. If we delve a wee bit further and check on past holders of the principal offices of the Scottish Cross-Country Union, we find that he was Treasurer from 1972 -93, succeeding his father Duncan who had held the same position from 1946 to 1972. In other words, the post had been held by the same family, father and son, for a total of 47 years. 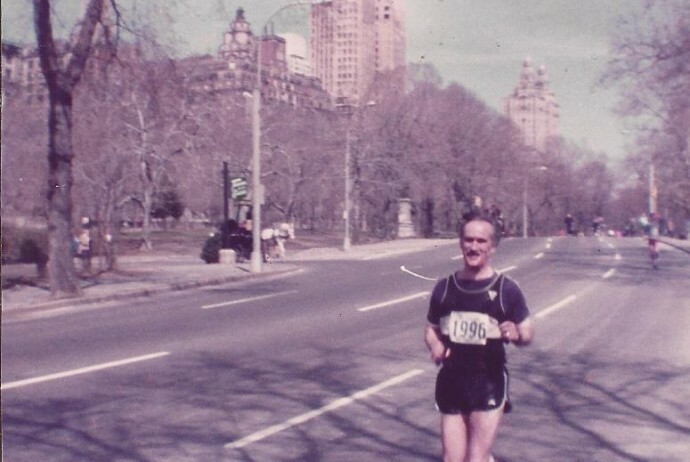 Although he liked running, he seemed to decide early on that he could best contribute by becoming an administrator and official and contributing to the sport in that way. Starting as secretary of Greenock Wellpark Harriers from 1958 to 1963, on moving to Nethervale Avenue on the south side of Glasgow he joined up with Paisley Harriers and immediately was voted into office as secretary of the club, a post he held from 1963 to 1969. Elected to the post of secretary/treasurer for the South Western District in succession to George Pickering in 1962 he held this until 1969, combining it with the same roles for the Renfrewshire AAA’s from 1965. Bob was by now on the SAAA General Committee (elected in 1965) and for a while, four threads – Club, County, District and National – were running in parallel. Staying on the SAAA until 1977, he was Honorary President in season 1975-76. Like all Presidents he was SAAA representative to the British Amateur Athletic Board for three years along with Ewan Murray, SAAA Secretary, and George Donald, SAAA Treasurer. In track and field athletics, two of the high spots had to be when he was a track umpire at the 1970 Commonwealth Games in Edinburgh and marathon referee at the 1986 Games. He did his share of work with SAAA track & field teams as wellbut it should not be forgotten in this litany of posts held and honours gained that he only operated at the ‘top’ end of the sport. He was to be seen at many events at local and national level too. One of his experiences of travelling with Scottish Track and Field teams was the trip to Iceland in the mid 80’s with George Donald. When they arrived, it was made clear to them that they were expected to sleep on pallets on the floor of a gymnasium. George and Bob made it clear to the Icelandic authorities that unless there was alternative accommodation provided then the Scottish team would not compete – at that point they were found rooms in the College of Agriculture! The match went ahead fairly successfuly. Bob worked on the National Committees of both track (SAAA) and Cross-Country (SCCU) disciplines simultaneously. By 1971 he was well enough known to be elected to President of the SCCU and the following year, 1972/73, he took over the treasurer’s seat from his father, Duncan, who had been treasurer from 1948 to 1972. The handover made the headlines in the ‘Glasgow Herald’ of 30th April 1973: McSwein Hands Over To His Son. ‘ He held that post until the formation of the SAF in 1993. With the formation of that body, Bob ensured a smooth transition by acting as the Commission Convener for 4 years. 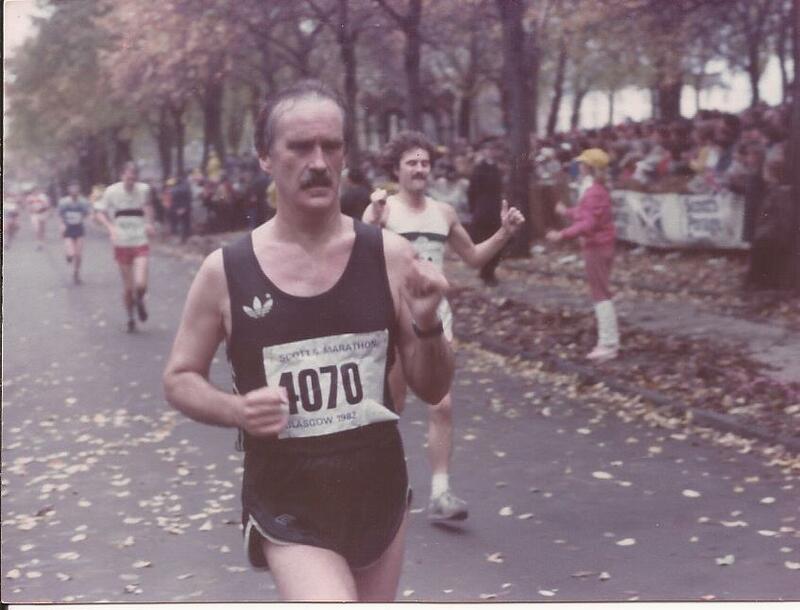 Scotland was represented in the international cross-country championships until combined with a GB team in 1967, and Bob served as part of the SCCU administration at world cross-country championships from 1971 to 1987. It was a period when the Scottish cross-country running was at heights unreached since the 1930’s and Bob managed many teams to events abroad and within the British Isles. He also worked with British squads and teams during this period. As Treasurer of the S.C.C.U., Bob was heavily involved in the staging of the World Cross Country Championships at Bellahouston Park in Glasgow (1978) and held the post of Financial Director. Thirty years later when the World Championships were next held in Scotland (Edinburgh 2008) Bob acted as Chief Judge. During the intervening years, and to this day, Bob was and is very active as an official. At that time Scottish teams were very popular in Europe and in addition to World Championships, three and four man teams were invited to prestigious local races in Elgoibar, San Sebastian, Madrid and so on. He recounts the story of the World Championships in San Sebastian when Jim Brown, after winning bronze and silver in the two previous years, finally won gold. Later that night when they went to the banquet Jim announced that he had lost the gold medal. No joking, he had lost the medal. They all went back the way they had come searching for the medal which was finally found in the gutter at the side of a road! The quality of the teams was very high – witness the Junior team that he travelled with to Madrid – Ron MaDonald who won, Jim Brown who was second and Frank Clement who was twelfth after leading the first of three laps. The result was a team victory – a rare occurrence on European soil. He twice went to Elgoibar with Lachie Stewart who was, he says, better known in Spain than he was in Glasgow. He also adds that Lachie never asked for expenses on tha grounds that if ‘they’ (the SCCU) were good enough to take him to a big race abroad, he wasn’t going to ask for the local expenses. Expenses requested are another thing altogether – there was one international athletes who included on his claim form ‘two sticky buns’). When the SCCU gave way to the SAF in 1993, Bob was elected as first convenor of the Cross-Country and Road Running Commission. 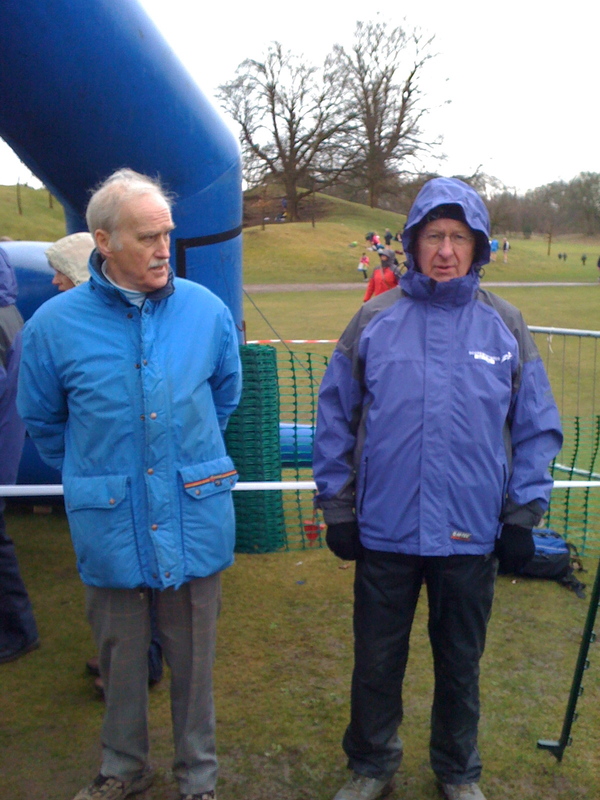 He is still officiating at cross-country events – last seen at the Scottish Cross-Country Championships at Falkirk in 2014 at age 79 – and is hoping for many more. *Lifetime Achievement Award by Scottish Athletics in 2012 (jointly with Ian Clifton). The Trust annually awards the George Dallas memorial Trophy to the person or persons who in the judgement of the Trustees, have achieved distinction in, or made a material contribution to, cross country, road running, track and field or hill running in Scotland in the preceding calendar year, whether they be athletes, administrators, coaches or otherwise involved in the sport. Previous recipients of the awards include Allan Wells, Yvonne Murray, Liz McColgan, Tom McKean, Tommy Boyle. scottishathletics remains extremely grateful to the George Dallas Memorial Trust for its continued support of Coach Education in Scotland, and for their support of the Coaches Conference in particular. A married man with two children and five grandchildren (one is a member of Kilbarchan AAC), Bob plays golf three times a week when the Scottish weather is kind enough. 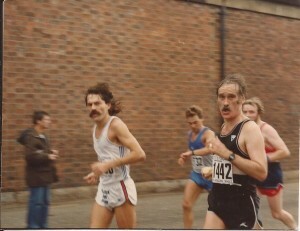 He is of course still to be found at road and cross-country races at all levels around Scotland.